The fun thing to do in Seattle is take a ride to the top of the Space Needle. The view is spectacular. If you have a fear of heights, it could be daunting, but worth it. You can stay inside and not go out to the edge of the ring around the top of the building and still see quite a lot. I’ve gone up with my husband and son a couple of years ago. It was an experience, but I want to go again, since I lost my fear of heights last year. 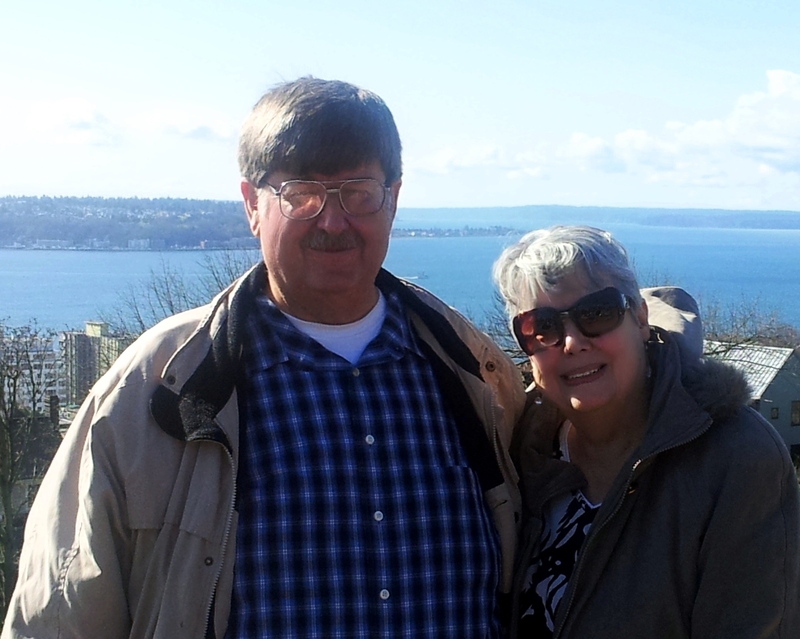 David and I in front of the space needle. 10 seconds: see the sparkling waters of Puget Sound. 20 seconds: Mt. Rainier becomes a huge snow cone. 30 seconds: skyscrapers appear like giant Legos. 41 seconds: you’re up saying “Ohhhhhhhh” on the O Deck. Get your pointing finger ready! Every degree of the O Deck’s 360-degree view commands your attention. Snow-capped Mt. Rainier to the south and the Cascade Mountains to the east, the majestic Olympics to the west. Click here for more information. How safe is the Space Needle? Click here to see. If you would like to watch a video on what it is like to ride the elevator to the top, click here.